A choropleth map displays divided geographical areas or regions that are coloured in relation to a numeric variable. It allows to study how a variable evolutes along a territory. It is a powerful and widely used data visualization technique. However, its downside is that regions with bigger sizes tend to have a bigger weight in the map interpretation, which includes a bias. 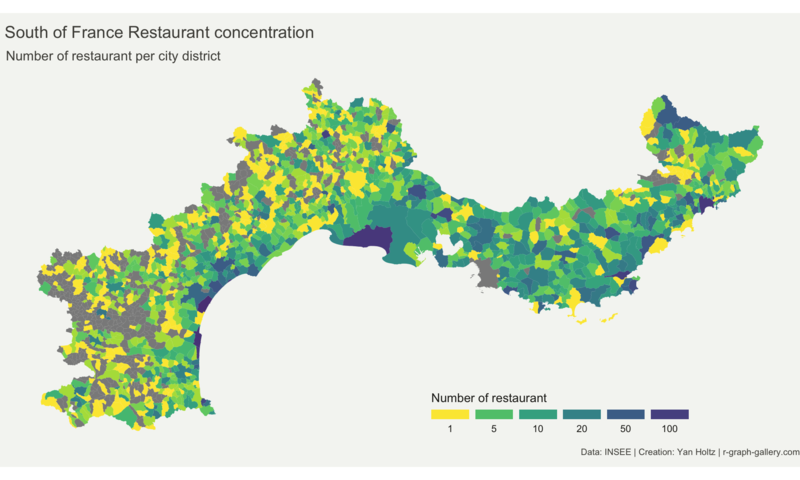 Here is an example describing the distribution of restaurants in the south of france. caption = "Data: INSEE | Creation: Yan Holtz | r-graph-gallery.com"
Note: Boundaries of city districts come from here. Number of restaurant per district comes from here. Important Note: Here, the absolute number of restaurant per district is shown. Keep in mind that an important bias is present: districts with large area and / or high number of inhabitants are more prone to have a lot of restaurants. Don’t call it chLoropleth map. Display a aggregated value for each region of the map using color gradients. Display bubble on a map background to represent the value of a numeric variable. The basis for any geographic data visualization is to build a good background map.